BEIJING - Swapping a pencil for a new teaching building? That's exactly what Liang Shuxin did through a series of trades on his micro blog. "The Internet world provides imaginative possibilities for philanthropy and makes it much easier, especially with all these new media platforms," said the chief business inspector of Tianya, one of China's largest Internet communities. When Liang visited his home village in rural Wuzhou, the Guangxi Zhuang autonomous region, last March, the dilapidated teaching building and enclosing walls of his old school shocked him. "I still remembered where I sat and played as a child, however, it had become too shabby to study in, or to look at," said the 35-year-old. While thinking about how to help the school, the idea of serial bartering suddenly came to him as he recalled similar success stories. Liang decided to give the idea a try, starting a bartering program online with a borrowed pencil from one of the school's students and a short passage wishing for better classrooms. Barterers only had to provide pictures of things they'd offer, plus estimated prices and their contact information. Liang aimed to collect 150,000 yuan ($23,000) by auctioning the final item he got. Only half an hour later, the first offer was made - a piece of Meiji chocolate, which was soon swapped for a new rice cooker, then a printer, a sports jersey and a combo portrait shot later that day. It became so popular that celebrities like actress Yao Chen, anchors Zeng Zimo and Wang Kai, whose offer of one hour of dubbing was later auctioned for 50,000 yuan, got into the act. The program collected more than 160,000 yuan in 25 days, drawing wide praise and media coverage. The new teaching building, now painted and equipped with new desks, will be put to use next semester. As manager of Tianya's philanthropic programs, Liang has initiated several other charity plans on the Internet, such as aiding quake-hit zones in Sichuan and Qinghai provinces and relieving snow-ravaged South China in 2008. He refers to his form of charity, which makes full use of micro blogs and other new media, as "micro-philanthropy". "It's all right to contribute as little as five yuan, or nothing at all - because something as simple as retweeting can help as well," he said. The slim man in a white T-shirt talks with pauses but becomes unstoppable when it comes to his philanthropic ideas. During breaks he browses his personal micro blog. "Examples of micro-blogging contributing to philanthropy will take place more often," said Liang, who wished to replicate his success and start another bartering program in December using a duck's egg to aid impoverished students. Inspired by the hit movie Let the Bullets Fly, Liang and volunteers designed a poster reading "Let the Egg Fly" for an online shop he opened to auction donated items for the program. "Creation and fun are two genes of micro-philanthropy," said Liang, who believes they give life to philanthropy and make it attractive. 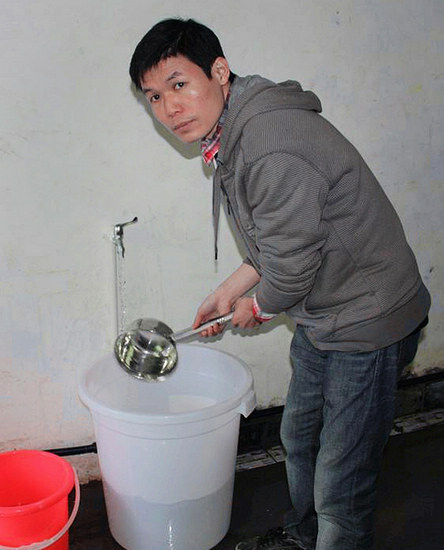 On March 9, after learning that nearly 200 students in a school in rural Guizhou would eat cold rice or corn porridge brought from home in plastic bottles, or sometimes simply not eat at all because the school had no canteen, he initiated a "Free Lunch Program". Besides the micro blog, Internet forums and chat groups, Liang also invented "virtual loving lunches" to sell at his online shop. "A virtual lunch of five yuan gives a starving child two free meals," he advertised on the front page, and within the first hour more than 1,000 were sold. In less than 23 days Liang's charity program brought hot meals to the students, with a promise that the favor would last a minimum of three-years, supported by total donations of 360,000 yuan. Having collected more than 1.2 million yuan as of early June, Liang's charity team was able to extend their program to 351 students in another school in Guizhou and is reaching more schools. It was estimated that 250,000 people contributed to the program. "That's the real power of micro-philanthropy," Liang said gladly. To cut growing concerns over illegal fundraising with the accumulation of the charity fund, and to help more poor children in western China's poor regions, Liang teamed up with State-run non-profit organization Guizhou Youth Development Foundation. Growing up in poverty-stricken rural Guangxi, Liang has made helping needy children a major part of his philanthropic endeavor. "I know too well that a little help can make a big difference to them," he said.